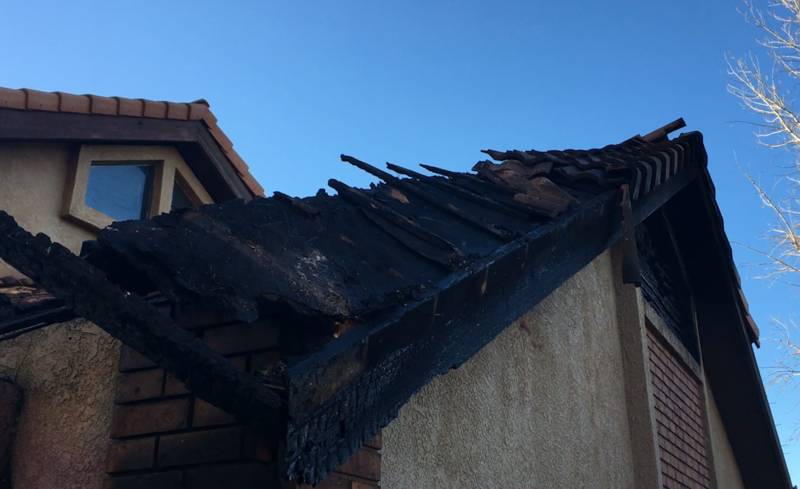 ST. GEORGE — The roof of a burning St. George home collapsed as firefighters battled an early morning blaze Tuesday and rescued a dog trapped inside the residence in the process. At approximately 4:45 a.m., neighbors of a home on the 1400 East block of 1850 South, just off River Road, called 911 to report a structure fire, St. George Fire Chief Robert Stoker said. Upon arrival at the scene, fire crews found flames spreading out the front bedroom window. 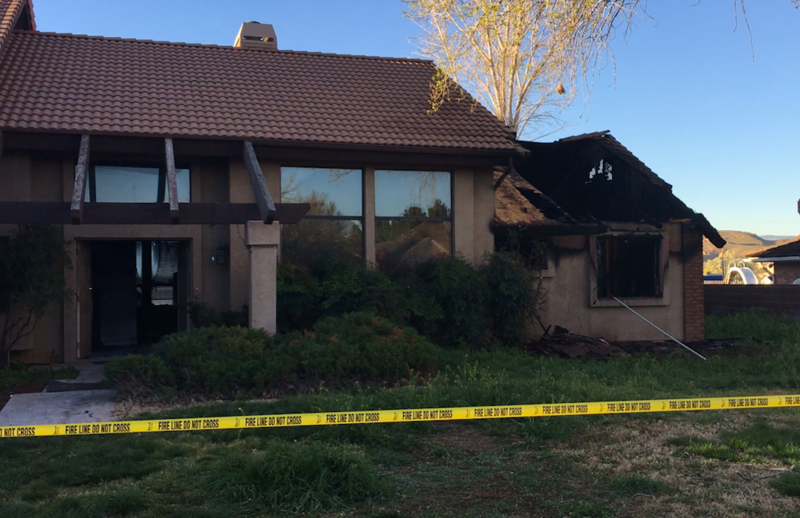 Once firefighters got the fire knocked down, crews went inside to conduct a primary search and verify no one was still inside the home, as well as carry out a fire attack on the lower level of the home. Second crews then went in and conducted a search on the second floor. 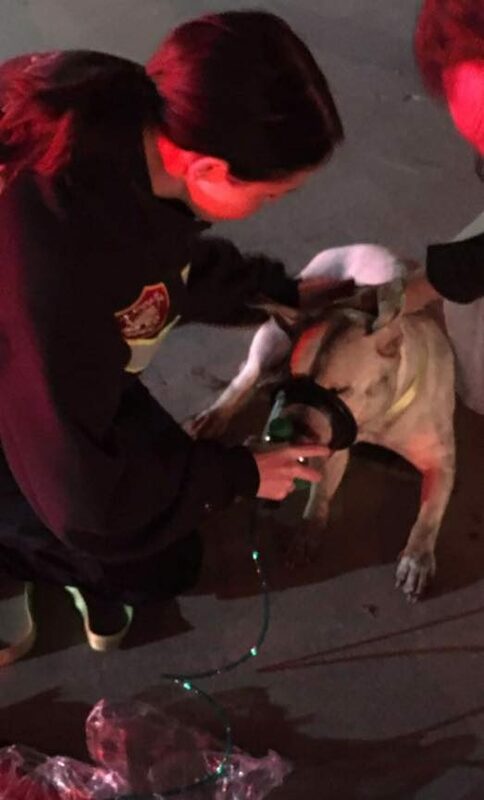 With the assistance of Gold Cross Ambulance paramedics at the scene, firefighters were able to give the dog oxygen with the pet oxygen masks recently provided by the Emma Zen Foundation. “The dog’s doing well now, reunited with the owner and doesn’t seem to have any other effects from smoke inhalation,” Stoker said. Firefighters also found fire in the lower attic, Stoker said, noting that a sheet rock wall between the attic on the lower section of the home above the burning bedroom and the vaulted ceiling in the middle of the home held the fire from spreading farther through the attic. Fire crews went in and did a secondary search and extinguished the remaining areas of fire. While the cause of the fire is not yet known as of this report, Stoker said interviews with the homeowner and his adult son provided leads to several areas firefighters need to examine that may help determine the fire’s origin. The homeowner suffered minor smoke inhalation and was treated by medical personnel at the scene, Stoker said. Batteries should be changed in all smoke detectors at least twice a year, Stoker said, adding that Daylight Savings Time is an ideal time for people to remember to do that.